The so-called Dead Zone in the Gulf of Mexico. Despite increasing amounts of runoff from farm fields in Iowa and elsewhere, this year’s so-called “dead zone” in the Gulf of Mexico is much smaller than expected and researchers are surprised. Nutrients from crop fertilizer and manure flow downstream and spur algae blooms, cutting oxygen levels and killing fish. 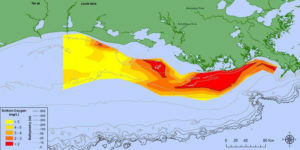 Louisiana State University oceanographer Eugene Turner says last year’s dead zone or hypoxia was the largest on record. “The conditions aren’t that different from last year when we had the really large one, the largest one yet,” Turner says, “and…I’m still a little flummoxed about this.” This year’s dead zone is about the size of the state of Delaware, half as big as scientists thought it would be and less than a third the size it was in 2017. Even though the impacts seem smaller this year, Turner says polluters aren’t off the hook. “Of course, they’re not because we have a five-year running average,” Turner says, “and at least from a science point of view, we’ve always said and continue to say, the environment itself is changing every year.” Turner says changing ocean currents may account for the higher oxygen levels. This year’s hypoxic zone measures 2,700 square miles, compared to last year’s 8,700.